Snow crunched under my heavy boots as I stepped out of the heated SUV, into the freezing winter of Ladakh. It was -16 degrees and we had just arrived in Puga, a little nomadic village in the Changthang valley. 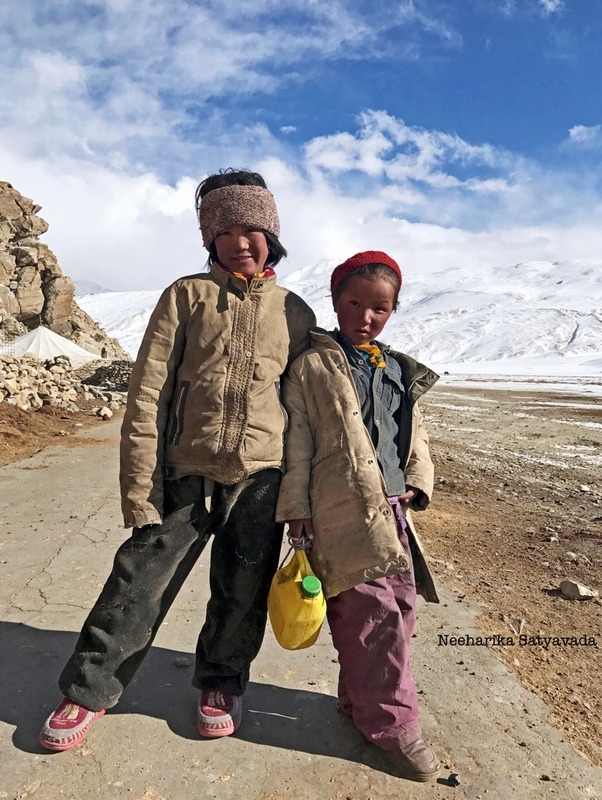 Located in the Eastern Ladakh Region of Jammu and Kashmir, Puga is a geothermal field and the site where the nomads of Changthang settle down for the winter and tend to their animals in the sub zero Himalayan temperatures. This 12 kilometer stretch of Himalayan valley in the Changthang Wildlife Sanctuary has been identified as one of the important geo thermal sites in India by the Geological Survey. This winter home of the Changpas is a harsh and unpredictable land interspersed with geysers and hot springs and come winter it is blanketed in snow. Changpas are Tibetan Nomads who follow the same migratory routes in Ladakh every year, only to settle in Puga for the four cold months. Staying in the same encampments, these ‘Nomadic Pastoralists’ bring their livestock to the same seasonal pastures every year. The Changpas rear yaks, horses, sheep and also ofcourse the famous ‘pashmina’ goats. The geo thermal ice fields of Puga serve them well as winter pastures for the snow and its melt bring greenery to this high altitude cold desert.It is an important season for the nomads for January and February are the birthing months for their cattle and it is also when the pashmina fur grows. Here is where we stopped for lunch, Puga, setting up kitchen in one of the stone walled corrals. By the time we had warmed ourselves with some Kashmiri Qawah, we were surrounded by curious eyes and runny noses. Little nomads were every where, shy but interested in the newcomers all bundled up in their down jackets. “That’s my dog, see, he is a nomad dog” said Tenzin in hesitant but clear English, perceptive to the point that she knows that we regular people would find anything ‘nomadic’ fascinating. Hanle, which is 115 kilometers from Puga is where she goes to school. Sumdho is the closest town though, we had passed it on our way here and I had naturally assumed this is where these little ones in this remote corner of India, who spoke such good English would go to school. Only in conversing with her did I realise just how far across the Himalayas the Changpas traversed for livelihood. The Changthang Wildlife Sanctuary is spread across India and Tibet and historically the Changpas of Ladakh would migrate with their herds into Tibet. But with how things are politically today, this is no longer an option for them. Getting There: Puga is at a distance of 180 kilometers from Leh, the largest and the one town in the region that has all the amenities that one is used to otherwise. Read network coverage. It would be wiser to drive to Chumathang though, stay overnight and do a day trip to Puga from there on. Chumathang to Puga is less than 40 kilometers but the route will take a good 4 hours, so start early! Stay: Chumathang Hot Springs Guest House. They have heaters in some of their rooms & that sure is luxury for a winter in Ladakh. PS: Know a friend who would love to explore this non touristy side of Ladakh? Then, please do share this post and spread the love! Love the images! Must say the ice clad part looks like Narnia!